They say we spend a third of our lives sleeping and when it comes to my sleep I don’t like to be short changed. I’m someone who sleeps in planes, trains and automobiles. As a kid if I wouldn’t sleep my parents would only need to drive me around the block and I was out like a light. As an adult it became a bit more embarrassing. My first business flight many years ago was to Rarotonga in the Cook Islands and I woke up with my head on the shoulder of the stranger next to me. Mortifying but it wouldn’t be the last time it happened. I really can sleep anywhere, that’s not my issue. The problem is the stiff neck and not being able to turn my head for the next few days which can be a major inconvenience, not to mention painful, when travelling. Being diagnosed with arthritis explains some of the discomfort but the diagnosis doesn’t do a lot to relieve this type of situational based pain and muscle spasm. 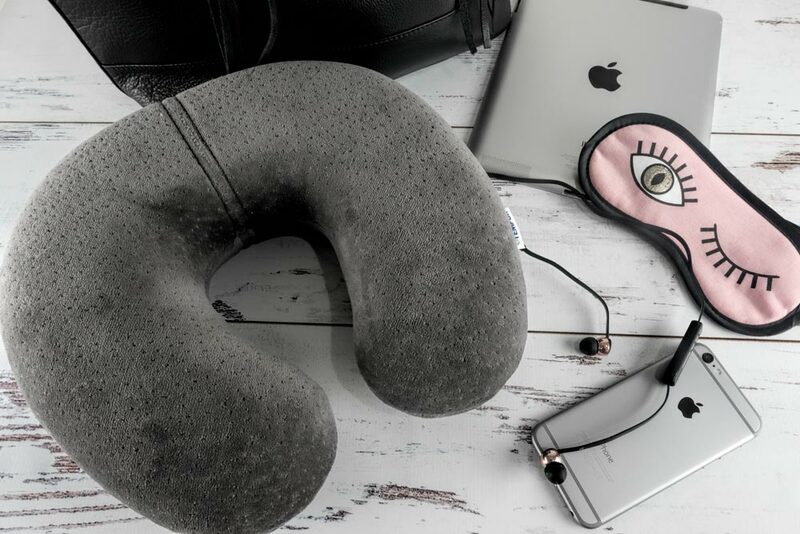 With a number of road trips and flights already planned for this summer I was super excited when Tempur Australia contacted me to test out their Tempur Transit Pillow. If anyone can road test a pillow it would have to be me. When I received my pillow I had only a passing familiarity with the Tempur products. I knew a couple of people who swear by their mattresses but I’d never tried them out myself. Being a bit of a tech geek and one who loves a good story I was way more impressed that my neck was going to be cocooned as I slept by the very stuff that cushions NASA astronauts against the massive g-force exerted on their body during take-off on a space flight. I mean how cool is that, I would survive g-force of up to 3 g (3 times normal gravity) if the need ever arose. NASA I’m here if you need me. The exact composition of Tempur is a closely guarded secret, so much so that it’s only ever produced in the company’s own facilities. While it sits within a broad range of products collectively referred to as ‘memory foam’ Tempur is a unique temperature sensitive, visco-elastic material. It conforms to the shape of your body with minimal counter pressure and then returns almost instantly to it’s original shape when the load is removed. A transit pillow is a formed cushion that’s shaped to sit around the neck holding itself in place. It’s used, as the name suggests, during transit, designed for use in high backed upright seats such as planes, trains, cars and coaches. I’ll get this out of the way right up front. The Tempur is likely the most expensive transit pillow on the market especially in Australia where it’s RRP (regular retail price) is $210. This isn’t a spur of the moment purchase in the Airport bookshop. The Tempur Transit Pillow is extremely comfortable offering a number of advantages over it’s cheaper counterparts. It’s shape and materials allow it to rest around the neck and support the head in a neutral position. Because it gently molds to the shape of your face and shoulder it allows the muscles in the shoulder and neck to relax providing the body with more complete relaxation and preventing the stiffness and twinges often experienced later. The material is difficult to describe, both soft and dense at the same time which absorbs a good portion of the vibration and jolts you experience in flight which in turn helps you rest more soundly. The shaping is comfortable to wear around either the back or front of the neck depending on what you find most convenient for your sleeping style and the seat. The cover is a soft suede-like texture that is soft and comfortable against the skin even in hot weather. I’ve previously tried the polyester and plastic inflatable versions and found them to be sticky and irritating on my skin as we often travel in tropical destinations. My immune system isn’t great and flying poses enough risk of catching a bug on the way to your exotic destination without being exposing to any additional germs or irritants. I prefer not to use the airline supplied pillows and blankets for that reason so always travel with a pashmina scarf to wrap as a blanket if I’m cold and now my pillow. The Tempur transit pillow comes with a fitted cover that can be removed for washing keeping your pillow hygienically clean. The one thing I do wish the pillow came with is it’s own cotton carry bag. Due to the nature of a transit pillow you’ll be taking it out and about with you and setting it down in the airport and plane. It would be good to carry it in a breathable but lightweight bag to keep it clean when not in use. I’ve re-purposed a cotton drawstring bag emblazoned with a clothing store brand but it does the job and the handles loop easily over the pull up handle on my suitcase. The major downside of travelling with a transit pillow is it’s something else to fit into your luggage limit and carry. Tempur is a dense material meaning that the pillow weighs around 475g (according to my baking scales) and measures 30 x 28 x 8 cm. How well that fits into your allowance and bag is going to depend a lot on what sort of traveller you are and how much you value your comfort. I find the travel pillow extremely comfortable. It sits well on my shoulders and for me provides the right level of resistance allowing my neck muscles to relax and absorbing the the jolts and vibrations from travel. Certainly if I’m planning a long haul flight in economy or a train journey it would make a significant difference to my comfort and would be in my hand luggage for sure. Thanks to Tempur Australia for providing the Transit Pillow for our review. Toni this is an excellent review. I like your humour Re being ready for NASA. Hang on that was meant as humour wasn’t it? 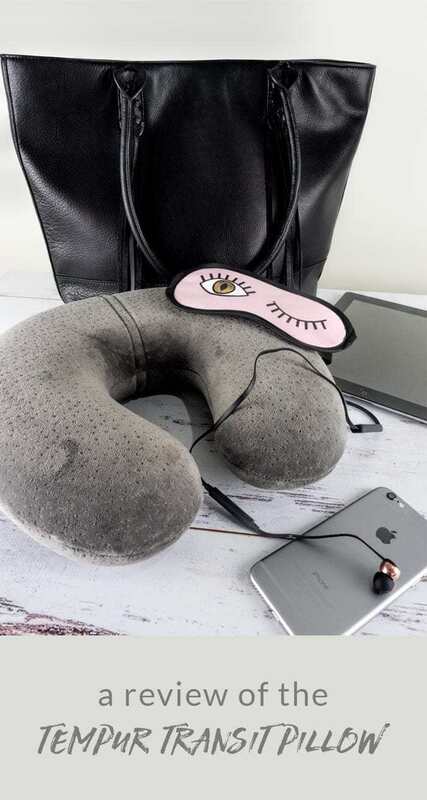 I would invest in this travel pillow if I was travelling more than I am at the moment.